8066 Musical tall case clock possibly by Elite. Fresh from an estate where it had been well taken care of for many years, this is a beautiful clock in fine condition. The case is solid mahogany with crossbanded inlay on the waist and base plus a multi-colored inlay panel in the base. It does have a small veneer nick here and there but overall the condition is quite good. The dial is very nice with a heavy brass base, pierced brass spandrels, a mat brass center and silvered chapter rings with applied brass numerals. The upper silvered dials are for “strike-silent”, “chime-silent” and “Westminster-Whittington”. It retains the original glasses, hands, pendulum, pulleys, key and brass weights. The three brass finials are replacements. 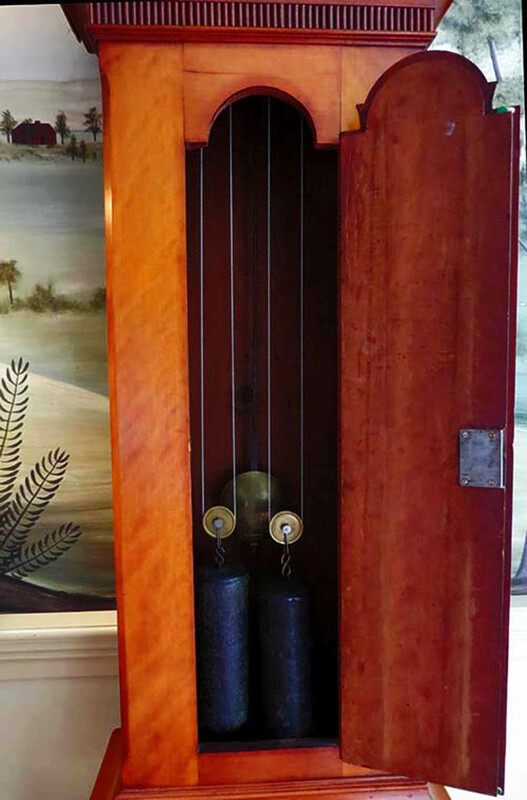 This is an eight day clock which plays a selection of two tunes on the quarter hours on a nest of eight graduated bells or four graduated cathedral gongs plus it strikes the hours on a fifth much larger gong. It is currently running and chiming properly. Special shipping can usually be arranged to most parts of the country. Call for an estimate. 8065 Fine Pennsylvania tall case clock. This clock was purchased from an estate in the Allentown-Bethlehem area where it had remained in the family for many, many years. The dial is unsigned and I have not spent a great deal of time researching the clock but it does have characteristics that match other clocks made in that area. 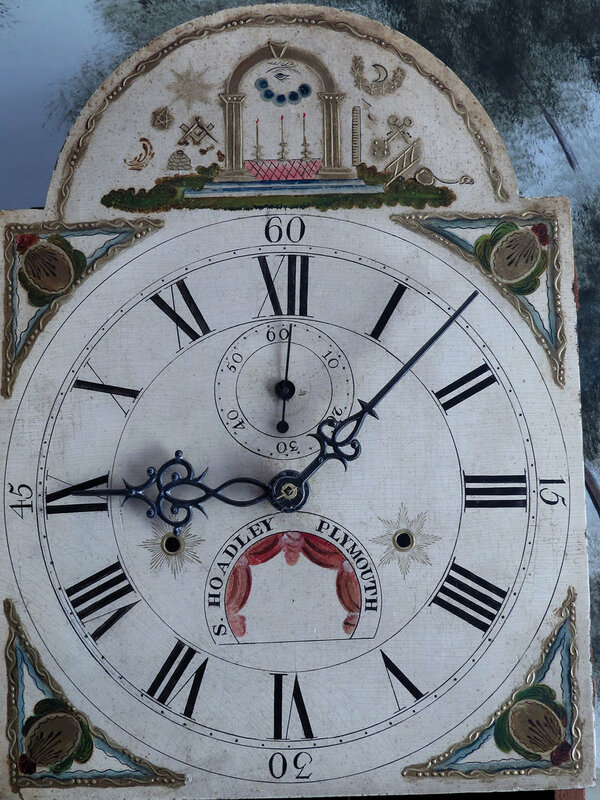 If you look at pages 182 and 183 of James W. Gibbs’ “Pennsylvania Clocks and Watches” you will see a tall clock made by Josiah O. Beitel of Nazareth. That clock has a very similar carved fan on the waist door and a very similar dial treatment. 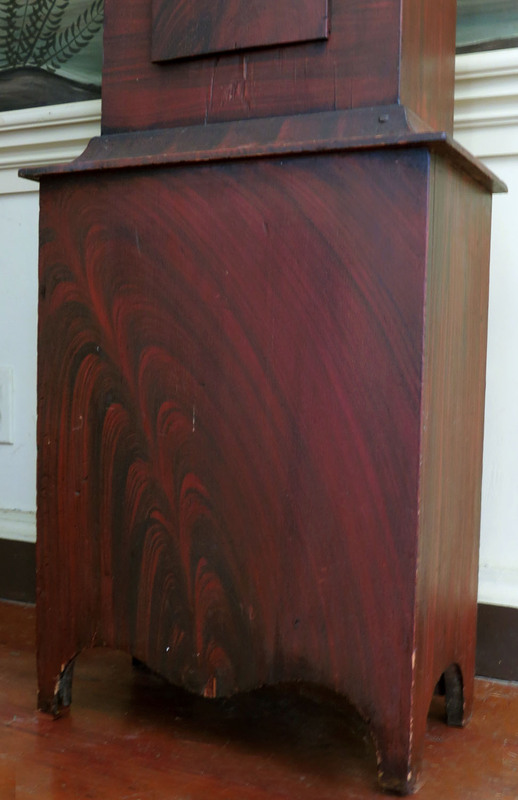 The case is solid cherry, beautifully refinished and in virtually perfect condition. It has a raised tombstone panel in the base and carvings on the scrolls which are distinctive characteristics and would probably help identify the maker. I believe the turned wood finials are the originals. The painted dial is simply wonderful and virtually flawless. 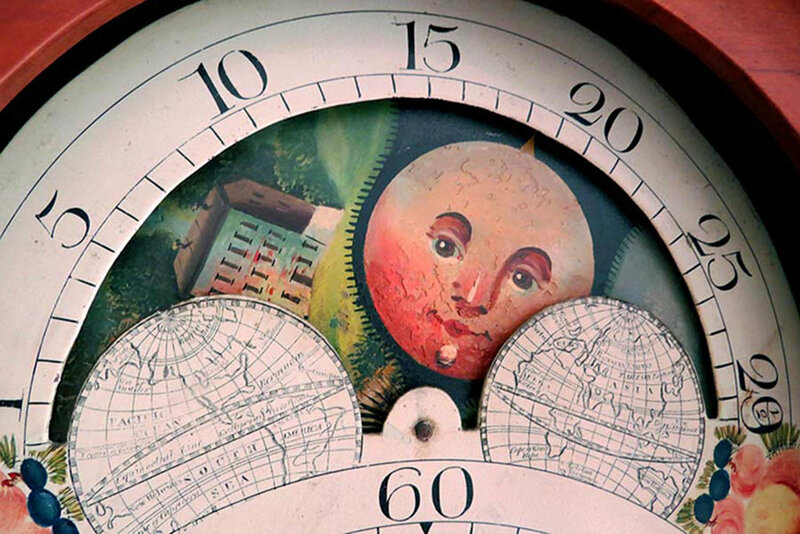 It has colorful cornucopia spandrels done in gold, bold numerals and a delightful moon phase. It retains the original hands, pendulum, pulleys, weights and crank key. This is an 8 day clock with hourly strike on a bell. It was recently professionally serviced and is in good running order. This clock has the original grain painting that was meant to resemble rosewood. Often this paint is quite worn or scuffed up but this example is in much better than average condition. I do not see any broken or chipped pieces and it does not look like it has lost any height by having the scrolls or feet trimmed. The dial is also much better than average. It is signed, the corners are done in raised gold and the arch has many Masonic symbols. The numerals are all crisp and clear and there is no paint lifting or flaking. The dial is the standard size of 12” by 16”. The clock comes with the original pendulum and weights while the hands are proper style replacements. This is a 30 hour clock with an ivory bushed wood movement that has an hourly strike on a bell. As a bonus, this clock was recently serviced, has new weight cords and is in good running order.